Tonight I’m trying a couple beers I picked up last time I was in Madison. The first two are from Capital Brewery out in Middleton, and the third was brewed by Ale Asylum on the northeast side. Capital is renowned for their lagers, so I’m trying their märzen as well as a new beer that just might wholly embody badger nation. Ale Asylum, on the other hand, is known for beers overflowing with hops, so I’ve got a double India pale ale to round out the night. 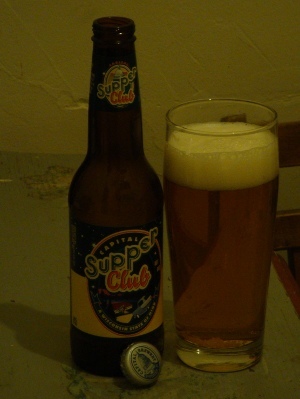 The Supper Club looks about what you would expect, crystal clear, a golden straw color, with some bone white head. More head retention than your average American-style lager. The nose is very subtle. Some bready malt and the faintest herbal hops are balanced by the right amount of sulfur. Right for the style, that is, but still too much for my taste. The flavor, too, is remarkably average. A decent malt character, but nothing to write home about. Again, the noble hops work themselves in, but almost imperceptibly. The taste of sulfur adds some background noise that could come from the yeast, but perhaps it’s a veritable corn adjunct. The body is on the weaker end, even for this type of beer. Overall, this beer would fit in nicely with many made in this country in times past, but I’m not sure it’s enough to warrant production by an otherwise respected brewery. Since it’s not as hoppy as PBR nor as malty as Bud, I just don’t see myself ordering it. I suppose it fits the bill, though. 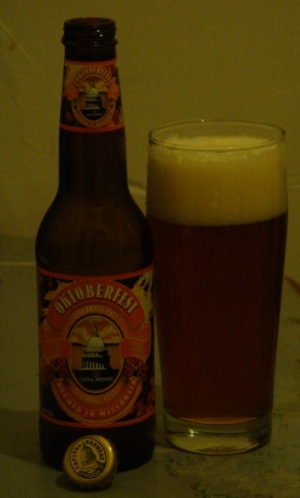 Next up I will be trying Capital’s Oktoberfest lager. This märzen has a thick and pillowy off-white head above a mildly hazy, gamboge-colored beer (hardly the “fiery amber” they claim). The nose has that restrained maltiness that many Oktoberfest beers do, the sensation of bread and barley just under the surface, trying vainly to break free. The hops add a hint of herbal character to the aroma. As it opens up, the toast becomes more noticeable, but it is still much too restrained. The flavor is richly malty. Bread, biscuits, and toast combine with the taste of my sister’s homemade pizza crust. 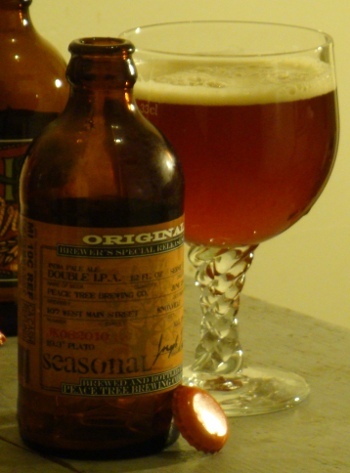 This strong and supple malt flavor is backed with a reasonable herbal hop flavor, though for a style originally intended to exhaust all the hops for the season, it could use more. A light residual sweetness and mild bitterness tease the palate. Both disappear relatively quickly, leaving a sessionable beer, as any Oktoberfest should be. Tonight I will be rounding out these relatively mild lagers with an aggressively hoppy double IPA from Ale Asylum. The Satisfaction Jacksin pours a very hazy mahogany. The pale golden ochre head is full and creamy. The nose is hoppy. Quite pleasantly hoppy. This beer exudes the citrusy character for which Pacific Northwest-grown so-called C-hops earned their place in the hop pantheon. No wonder it is so hoppy, as it has “over 3 pounds of Centennial per barrel.” I could sit here just smelling this all day. But I have to try it. The taste is hoppy. Quite pleasantly hoppy. Rich floral and citrus flavors burst forth, backed up by a solid malt foundation. The caramel and toast flavors of the malt meld harmoniously with the grapefruit character of the hops. Amazingly, there is almost no perceptible bitterness, despite the significant hopping rate. A full and creamy palate certainly works to that end, balancing what bitterness was to be had, while remaining fresh and lively. This beer is like Cookie Monster: big, fuzzy, and sweet. And one more note: if you search for this beer, do not click on the link for “Satisfaction Jackson,” that’s not what your looking for. Astute readers may remember that I said I had lost the notes I took on the Sprecher Brewery tour. Well guess what? Cleaning out my disc golf bag I found them! That’s certainly a strange place to put them, but that’s where both of my “lost” pages were squirreled away. First up, the Mai Bock. This blonde beer has a slight amber tint. There is barely any haze below some creamy white head. The aroma is bright with malty caramel and bready notes. The taste is dry and the body thin, so immediately this seems almost flavorless. Upon inspection you may note the hint of a dirty, earthy hop flavor that reminds me somewhat of the hops in PBR. Next I tried the IPA², their double India pale ale. This one is a pale caramel amber color and is almost clear. The head is creamy and off white. There is a slightly sweet, delicate floral hop nose that comes through as lilacs and roses. The flavor is rich with earthy hops. On the sides of the tongue a somewhat one-dimensional bitterness disappears quickly, leaving a lingering malty sweetness. 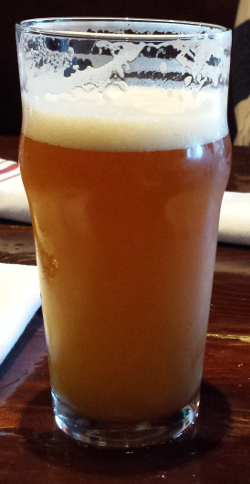 Then, at the behest of the brewers, I tried Hop on Top, their new extra pale ale. They were soliciting comments, so presumably this was still in beta, and it showed. Brilliantly clear and the color of straw, this beer has only a hint of white head. The hop aroma is grassy, sharp, and green (the character of fresh, unkilned hops). The first thing I notice on the taste is that the body is pathetically thin and the beer entirely lacks malt flavor. There is a strong grassy hop taste, but this takes on the almost medicinal character of hop extract. Watery and thin, this beer is actually very unpleasant to drink. To wash that taste out I had their Russian Imperial Stout. It is pitch black with a big pillow of tan head (that doesn’t quite last long enough). The nose is mild, earthy, and dry, with toast and a good amount of coffee. The roasty and robust flavor, strong with coffee (though not overpowering), is almost meaty. A light sweetness and plenty of carbonation activity keep this richly flavored beer from being oppressive. Sprightly, like Chris Farley. All the beers from Brasserie d’Achouffe in The Ardennes of Belgium are named something with “chouffe”, Flemish for gnome or elf. Today I’m having Houblon Chouffe, or “Hop Elf”. This beer is labeled a Dobbelen IPA Tripel, so it’s a hybrid style that takes inspiration from both American Double IPAs and Belgian tripels. 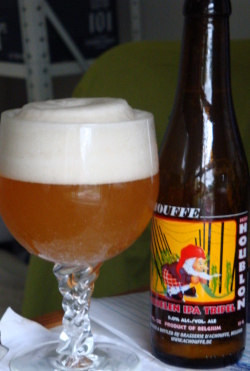 The Houblon Chouffe is a turbid yellow gold. The head is massive, pillowy, and white. The aroma is complex and compact, a wonderful marriage between an IPA and a tripel. The tripel character is just a bit more prominent, possibly because the bottle is not entirely fresh (thank you, Iowa ABD). The nose is strongly peppery, with toasty malt and an herbal and earthy hop presence. The taste is immediately a bit bitter and a bit alcoholic. Some pale malt flavor comes out as well. 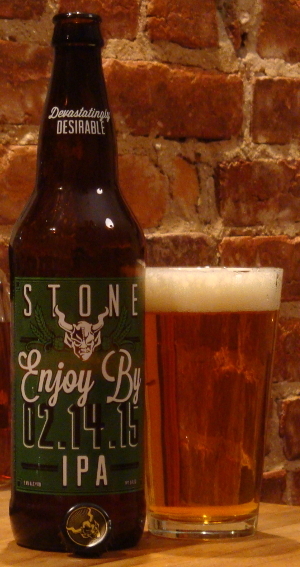 Earthy hops provide a background that indicates it really is half of an IPA. It grows just a little sweeter through the taste, and it’s not too active so the palate is quite creamy. All in all a tasty beer. Last night Trevor and I sampled a few hoppy beers. We were too tired to get to the fourth (Goose Island Imperial IPA) but I’ll rate it eventually. First off, Bell’s Hopslam, an Imperial IPA made with honey. I’m told this ages better than any other hoppy beer. We won’t really know because the bottle I have is from January of this year. It pours a beautiful orange-tinted gold, lightly hazy. The head is creamy, lasts forever, and laces brilliantly. The aroma is strongly of fruit: peaches, orange blossoms, and grapefruit. It is a thick, somewhat sweet nose. Immediately you get a strong floral, slightly fruity hop flavor. I note roses, orange blossoms, and apricots. The bitterness slowly grows to overpower the delicate flavor, and lingers. This beer is ever so slightly cloying, which actually balances the lingering bitterness. However, these long aftertastes do not get in the way of another sip. That’s dangerous at 10% alcohol. On to drinking it. Burton, an almost clear copper, pours a good straw head. 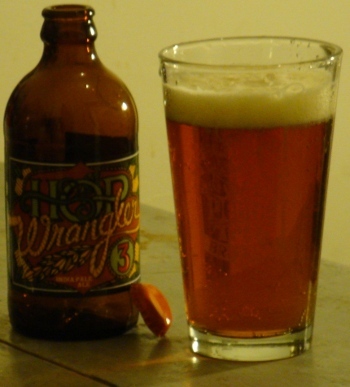 It has a light sweet aroma, somewhat herbal hoppy. There is also a significant caramel note and a little biscuit. I can also detect a bit of alcohol on the nose. Ethanol itself is not volatile, so you cannot smell it. A beer smelling boozy indicates the presence of fusel alcohols, a byproduct of warm, high alcohol fermentation. It is fusels that cause really painful hangovers. Right at first you notice both a prominent bitterness and a strong sweetness. This beer is thick, and its sweetness is cloying, probably from the use of a large percentage of caramel malt. The oak certainly also adds sweetness and vanilla. The hop flavor is herbal and grassy. I think perhaps the oak and the hops are competing too much in this beer. The hop flavor is too earthy. They would be better off using a lighter, more delicate flavor hop. Last we have a bottle from the Tyranena “Brewers Gone Wild” series. This is Hop Whore, their Imperial IPA. The appearance of this beer is not entirely appetizing. While it is a wonderful copper red color, there are some little chunkies floating and the head is somewhat soapy. The nose is great, though. A strong fruity hop aroma, peaches and some grapes. Quick sharp hop bitterness, a little fruity and a little sweet. Notes of hop spiciness, reminiscent of cilantro. While it is pretty bitter, this fades and it lingers balanced. Very drinkable.